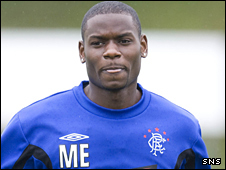 Police are scouring CCTV footage in a bid to find a fan who racially abused Rangers midfielder Maurice Edu. The club has made an official report on behalf of the United States international over the incident. It following Tuesday's Champions League defeat by Unirea Urziceni at Ibrox, the injured player being targeted by a Rangers fan as he went to his car. Strathclyde Police said: "We are currently working with Rangers Football Club to trace the person responsible." Police also urged witnesses into the incident, which happened in a school car park opposite Ibrox used by players on match days, to contact Helen Street police station. "Strathclyde Police has received a complaint regarding an incident where racial abuse was directed at a Rangers football player," said the statement. "The action of this individual is disgusting and completely unacceptable," said a statement on the club website. "Rangers will undertake a investigation to identify the individual in question and take appropriate action. "It is extremely disappointing that people such as this attach themselves to the wider Rangers support and tarnish the image of the club and its fans. "We would urge anyone who has information on the identity of the individual responsible to contact the club immediately." US international Edu had registered his disgust at the incident on his Twitter page, where he wrote: "Not sure what hurt more: result or being racially abused by couple of our own fans as I'm getting in my car." The club restated their commitment to the Show Racism The Red Card campaign and that this would be demonstrated at the home game against Hibernian on Saturday. The Rangers Supporters Trust condemned the incident and spokesman David Edgar said he hoped whoever was responsible would be punished. Billy Singh, Campaign Manager for Show Racism the Red Card, said: "The racial abuse suffered by Maurice Edu last night was totally unacceptable. "Would the same fans have reacted in the same way if he had scored the winning goal last night?" Edu moved to Ibrox from Major League Soccer club Toronto for £2.6m in August 2008.